"My kids love this. It's quick to prepare and nutritious." Heat the oil in a skillet over medium heat; cook the onion in the hot oil until softened, about 5 minutes. Crumble the ground beef into the skillet and cook and stir until completely browned, 5 to 7 minutes. Drain. Stir the kidney beans with liquid, pineapple with juice, ketchup, brown sugar, cornstarch, mustard, and salt together in a large bowl. Add the ground beef and onions to the mixture and stir to coat. 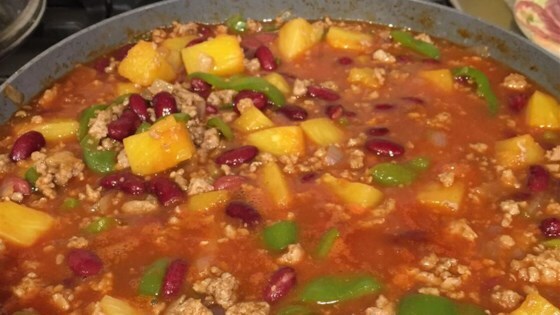 Pour into a large casserole dish. Bake in the preheated oven until completely heated through, about 45 minutes. See how to make classic California-style barbecued tri-tip. it was very tasty. my beans were a bit dry tho. I served it over rice to soak up some of the juices. I loved the pineapple in it. it was very easy to make and good enough to make again. Everyone loves it... We have it over rice... Only modification I have made is using crushed pineapple instead of chunks it more smooth and incorporated.